Experts unanimously agree that Systematic Investment Plan is the best way to invest in Equity Markets. But, SIPs are not an option for those who have unstable income like Businessmen, Doctors, etc who do not have "fixed" income to commit for SIP. For them, it is suggested to invest whenever possible a lumpsum in a Debt Fund and then do a Systematic Transfer Plan (STP). This ensures that they too get the benefit fo a SIP investment without having to worry arranging funds month on month. But both SIP and STP have 1 pitfall. That is, they buy units (stocks) on a predetermined date irrespective of market conditions. And, thus even if the market has zoomed up by 5% yesterday and again up by another 5% today, the SIP/STP is triggered making the purchase "costlier". To counter this drawback, mutual Funds have innovated and brought in products like HDFC Swing STP, Pramerica Power SIP, etc. But, among all these, the one which I think is most effective and useful is the PREPAID SIP from Edelweiss Mutual Fund. WHAT’S SO SPECIAL ABOUT EDELWEISS PREPAID SIP?? 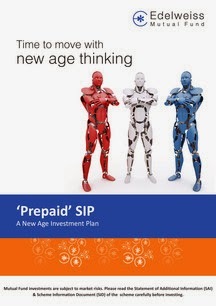 First let us understand how this Prepaid SIP concept from Edelweiss works. You will be investing a Lumpsum (minimum Rs.25000/-) in Edelweiss Absolute Return Fund/Edelweiss Ultra Short Term Bond Fund/Edelweiss Liquid Fund. What’s the difference and benefits? Benefit No.1: Since your investment is in a Liquid Fund/Absolute Return Fund, your funds are generating returns till the time they move into the Target Scheme on trigger. Benefit No.2: Indirect SIP happens whenever the switch is triggered. Benefit No.3: NO Exit load is levied in case of switch. Benefit No.4: Investor need not worry about monitoring the fall in Nifty and investing, the trigger will do the job. The Biggest Difference and Benefit is that the switch is triggered only when the Nifty falls by 1% or 2% which indirectly lets you “time” the market. The word PREPAID SIP is misleading as a SIP happens only a specific date with a specific amount. Still the product is innovative and could be used by investors who have Lumpsum in their hands (Bonus, Land sale, Lottery,etc). If you are convinced about the product and intend to invest, I suggest you to go for Edelweiss Absolute Return Fund as your Source Fund rather than a Liquid Fund. Edelweiss Absolute Return Fund is a kind of Arbritrage Fund and has consistently beaten its Benchmark by a wide margin and also have a higher CAGR compared to Nifty. Since the Nifty fall by 1% or 2% do happen regularly, the switch will also ensure that Capital gain taxation comes into play. So, instead of the debt fund, if you are invested in Edelweiss Absolute Return Fund, then Equity Taxation treatment is applied and if the trigger happens within 1 year of your lumpsum investment then only 10% tax is levied. Also, it is observed that Edelweiss Absolute Return Fund, inspite of being a Equity Fund, is a low volatility fund and has been pretty consistent with its return. The unique Switching option will ensure that you are buying units when the market falls and benefit from averaging your purchases. 2. Edelweiss AUM is meagre. In fact, no Equity Fund of the Fund House has crossed Rs.100 crores which can make some investors uncomfortable. 3. Investors may miss out on a extended Bull Market as no units are bought in a continuously rising market. (Though, I personally feel, that even in a continously rising market, there are sure to be 1%, 2% fall every now and then). Dont treat this Fund as a Emergency Fund. Those having a Lumpsum to invest can definitely look at investing in Edelweiss Prepaid SIP. Product is innovative and the Edelweiss funds have proved to good performers in their short history. However, those who have regular income and can afford monthly are advised to go for the typical Systematic Investment Plan.